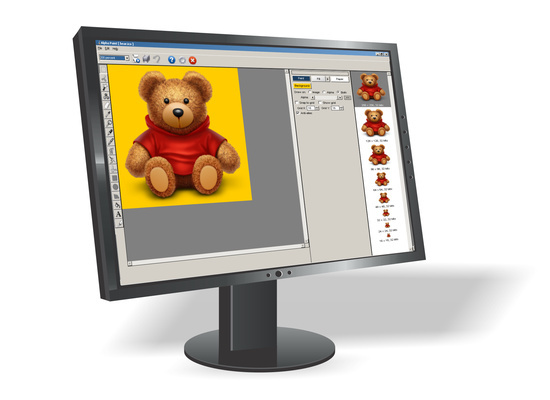 Alpha Paint is a sophisticated Windows paint application to draw and manage graphics with full alpha transparency. It will create professional web page images, eye-catching effects for social media, killer graphics for PowerPoint presentations, titles for videos and pretty much anything else that requires leading-edge art and transparency. In addition, it can create and edit Windows icons. Alpha Paint is intuitive, easy to use and it won't require that you get involved with complicated mathematics, higher-order spatial dimensions or a manual that requires more than one human lifetime to read. Anyone with sufficient eye-hand coordination to successfully operate a web browser should be able to master Alpha Paint in under an hour. Alpha Paint enjoys a variety of selection tools; antialiased drawing and text; full alpha drawing resources, soft brushes, local undo, variable magnification and an intuitive user interface — you might not even need its extensive, accessible documentation and tutorials. Create and edit alpha-channel graphics stored as BMP, PNG, and TGA files. Build professional Windows icons in minutes. Alpha-mask your photographs for seamless web page integration. Work quickly — the intuitive user interface of Alpha Paint will keep your mouse from melting down. Get up to speed with Alpha Paint's extensive documentation and tutorials. If you're uncertain whether you need Alpha Paint or our popular e-Paint image editing and drawing application, check out this comparison between them. IMPORTANT: Alpha Paint requires access to the Internet to validate itself after installation. Please see the discussion of registration key security for a detailed discussion of this functionality. Click on one of the following links to download Alpha Paint 9.0a revision 6. This file is 32,660,992 bytes in length. Alpha Paint™ is a trademark of Alchemy Mindworks Corporation. The title graphic at this page, Power Button, is by xoox xooxman, and is used under license from freeimages.com. The monitor graphic is used under license from DryIcons.